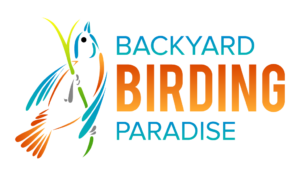 As I prepared for my trip back to our little slice of heaven in New Mexico, I decided to scout out a few new birding sites to visit while I’m there. It wasn’t long before I stumbled across the Gray Vireo Recovery Plan by the New Mexico Dept. of Game & Fish. 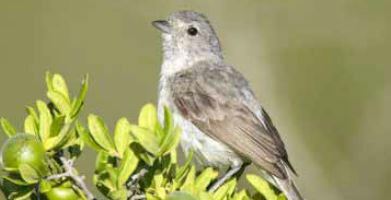 Interestingly, between 2007 and 2009 there was great interest in this sweet little songbird because it is considered a threatened species. 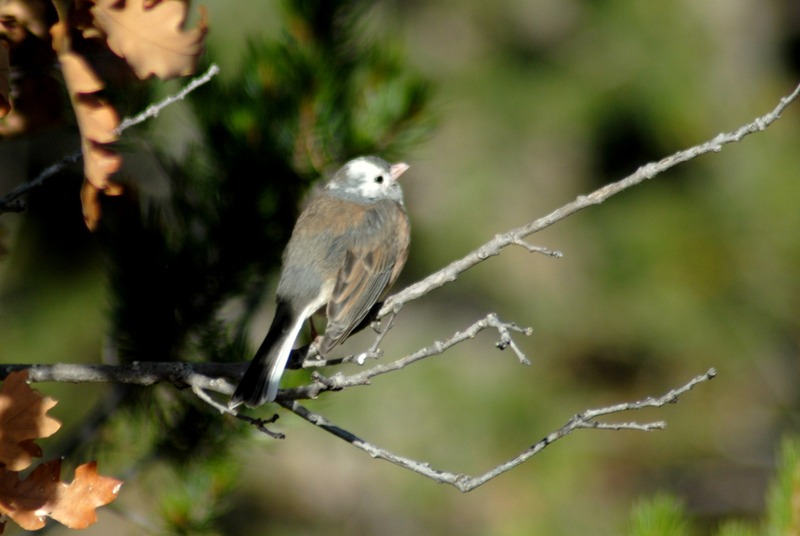 The Gray Vireo (featured above courtesy of NM Dept. 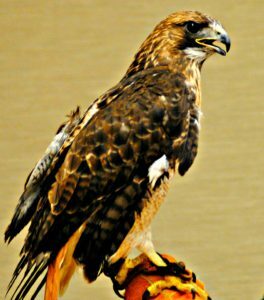 of Game & Fish) is typically found in the dry foothills and bajadas west of the Great Plains in New Mexico, and is associated with juniper, pinon pine, and oak trees – all of which are highly abundant on our property. Unfortunately, the distribution of this species is patchy at best, with 80% of the known sites found in twelve main areas in the state. 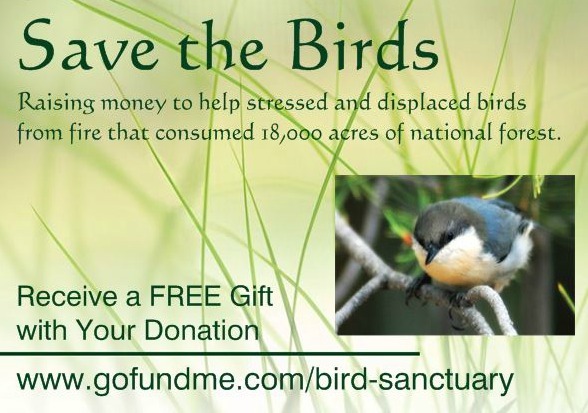 As of 2006, observations estimated only 418 Gray Vireo territories, placing this bird on the threatened species list. 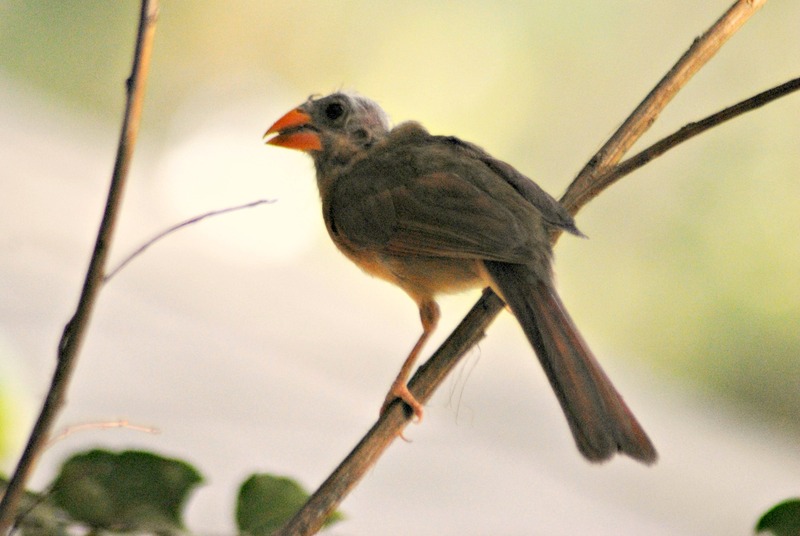 Primary threats include vulnerability due to its small population sizes and habitats, specifically from the alteration of nesting trees and brood parasitism by cowbirds. Additionally, Loggerhead Shrikes have been suggested as a potential predator, with other specifies praying on eggs or nestlings, including snakes, Western Scrub-Jays, Mexican jays, Northern mockingbirds, chipmunks, and coyotes. Goodness! Our habitat is home to all of these at any given time. But habitat alteration remains the primary threat and includes juniper control, firewood collection, removal of trees to facilitate oil/gas production… and fires! Now, I’m immediately reminded of the 18,000 acres lost to the Dog Head fire in June. Yikes! In the meantime, this sweet songster is known to arrive in New Mexico in April for breeding, and breeds through August before migrating to its wintering grounds in September. Since it’s now just early August, I’m keeping my eyes peeled for one of these beauties. 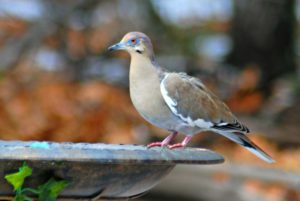 While they may be regarded as a “drab summer resident” because of their dull gray coloring, they are noted for their vibrant personality and song. 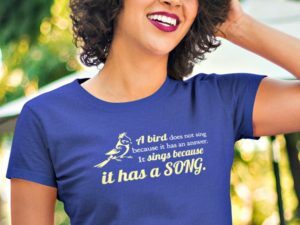 It would be exciting to spot one of these songbirds in my backyard. I might even have to make a call to the NM Dept. of Game & Fish and report it. Seeing this sweet girl for the first time nearly broke my heart! I just froze as I watched her eat at my feeder, trying to figure out what had happened to her. Poor girl. Convinced she was ill and had some sort of disease, I started my online research for an answer, only to discover that this phenomenon is somewhat of a mystery. I’m hoping it’s theory #2, which makes sense to me. 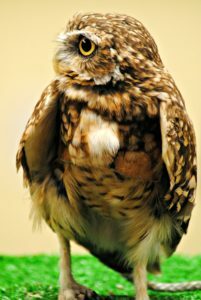 Once a feather has grown to full size, it is no longer connected to the blood supply. So, each bird must get a new set of feathers every year; this is what they call molting. I’ve only seen this one cardinal effected by this phenomenon, but I’ve read that it can also happen among blue jays and the common grackle. And apparently, it’s only adults and a small percentage of the species that experience this condition. It also just happens to show up in the summer. And sad, when you think that the female whose lost her feathers may have difficulty attracting a mate. But I did the happy dance for her last night when I saw a striking male feed her, which I assumed was part of his mating ritual. She may be the ugly duckling of cardinals, but he still thinks she’s fine. As I watch my fellow birders post their most gorgeous hummingbird pictures on Facebook, I’m disappointed that I haven’t seen any in my backyard in Houston, Texas. 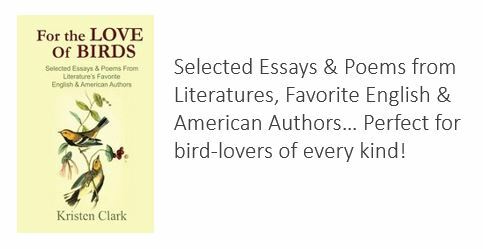 This is a surprise especially because hummingbirds are the second largest bird family in the world, with 18 of the world’s 320 species right here in the United States. 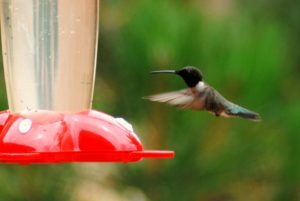 In Texas, birdwatchers can regularly view 9 hummingbird species along with 6 more that visit the state infrequently. So, why haven’t I seen them yet in my yard? The SPRING MIGRATION can be hard on hummingbirds as they move north from their winter homes in southern Mexico and Central America. Stops along the way may be for only a few minutes, or a few days at locations with abundant food supplies. First arrivals in the spring can be seen in Texas, Louisiana, and other sites along the Gulf Coast in late January to mid-March. Well, that explains a lot! I wasn’t ready for hummingbirds that early in the year, so they didn’t stop at my house for food. I didn’t have any out for them. Sigh. My loss. The FALL MIGRATION takes place in August and September, when hummingbirds are moving south to refuel in the early morning so they can travel midday and forage again in the later afternoon. So, I missed the spring migration, and I’m early for the summer activity. Hmm. I’m in between the seasons here in Houston. And, that gives me time to gear up in supplies and be ready for the migration peak in September. In fact, I remember last year seeing a few stragglers well into October. 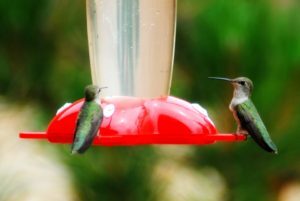 And, they may be a little early this year, as my husband and I spent a few days in Rio Rancho, New Mexico last week and the hummingbird feeders strategically placed throughout the resort we stayed at were well attended! The black-chinned hummingbirds featured here are exceptionally widespread, from deserts to mountain forests. And while many winter along the Gulf Coast, this little guy is a habitat generalist, found in lowland deserts and mountainous forests, in addition to natural habitats and very urbanized areas adorned with tall trees and flowering shrubs and vines. 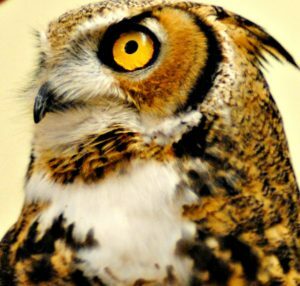 They can be observed along good stretches of some Southern Arizona and New Mexico rivers, where nests are often spotted every 100 meters or so. In the Southwest, they are most common in canyons and along rivers. In arid areas, you can find them near cottonwood, sycamore, willow, and oak trees. Considered the most adaptable of all hummingbird species, individuals rarely remain longer than one day at a feeder during migration, event when food is scarce. And, did you know? The oldest known black-chinned hummer was a female, at least 11 years and 2 months old, when it was recaptured and rereleased during banding operations in Texas. Oh he is beautiful, donning his gorgeous red cap and bib, and ready to dine at the finest table in our restaurant! And he is such a good sport about sharing his table after the other seats have all been taken. He isn’t deterred when the yellow-bellied woodpecker takes a seat on the opposite side. He doesn’t flinch when the male cardinal swoops in for a quick nibble. He doesn’t even run off when two white-winged doves land just overhead, obviously trying to intimidate the little fellow into leaving his plate for them. No, not this guy! He holds his own and dines until he’s had enough. And if he IS booted out of his chair, he waits nearby patiently, only to return after the bully has gone. 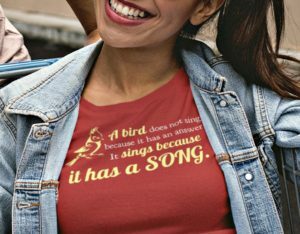 And since I don’t have larks at my house, happy as a finch is a perfectly appropriate phrase. The House Finch is known for eating almost exclusively plant materials, including seeds, buds, and fruit. Wild foods on this guy’s menu include mustard seeds, knotweed, mulberry, cactus, poison oak (really? ), sunflower seeds, and of course thistle. But did you know? The red or yellow color of a male House Finch comes from pigments that it gets in its food. 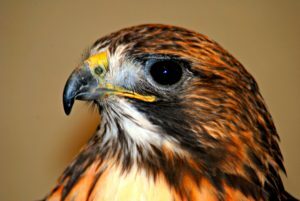 The more pigment in the food, the redder the male. This is important when pairing up with partners because females prefer to mate with the reddest male they can find. That explains why the female I’ve seen with this guy rarely leaves his side. She’s definitely staying by her man! 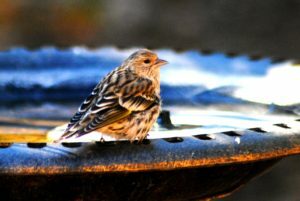 The House Finch is also highly social and rarely seen alone outside of the breeding season. I haven’t seen flocks of them in my yard, but I’ve noticed a single pair dining together most of the time. They even brought a friend over for dinner the other day. And, males are known to feed females during courtship in a display that begins with the female gently pecking at his bill and fluttering her wings, a ritual I have not yet observed personally. This activity stimulates the male to regurgitate his food for feeding to her. Also, the House Finch is a more recent bird species to the US and a focal species for the Celebrate Urban Birds! project. 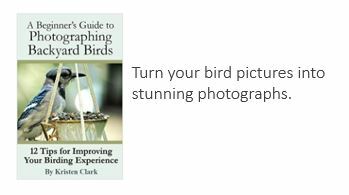 Take time to learn about this project and conduct a 10-minute count and record whether or not you see finches. I added my data just this morning! 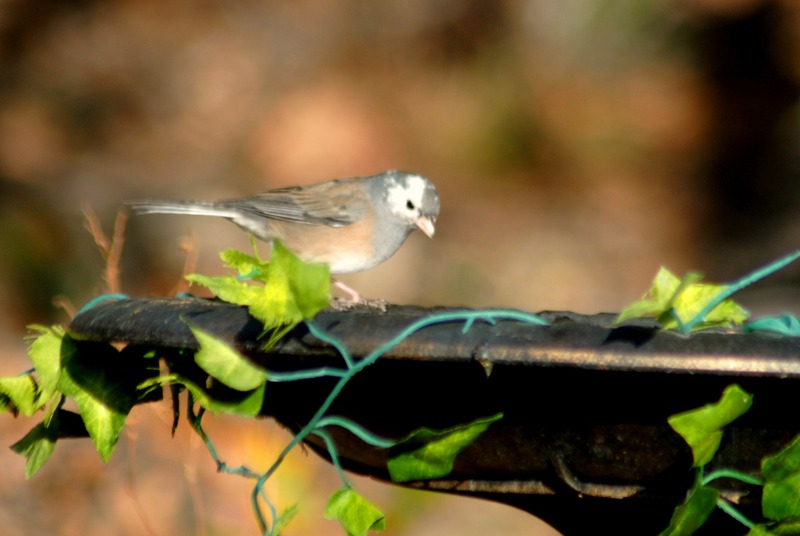 Look for these finches near your home, on nesting platforms, and at your feeders. One of the pine siskins in our backyard flew into our window and died. We still get snow at our house in New Mexico in March, and my heart sank as I watched the flakes gently blanket its lifeless body. That’s what I get for encouraging them. The birds. That’s what happens because I want to attract them to my home so I can take pictures of them and study them and draw them into my daily life. I was suddenly overcome with feelings of guilt and shame. I felt helpless as I stood over the dead bird. A tear dropped straight down as if to kiss the sweet bird goodbye. 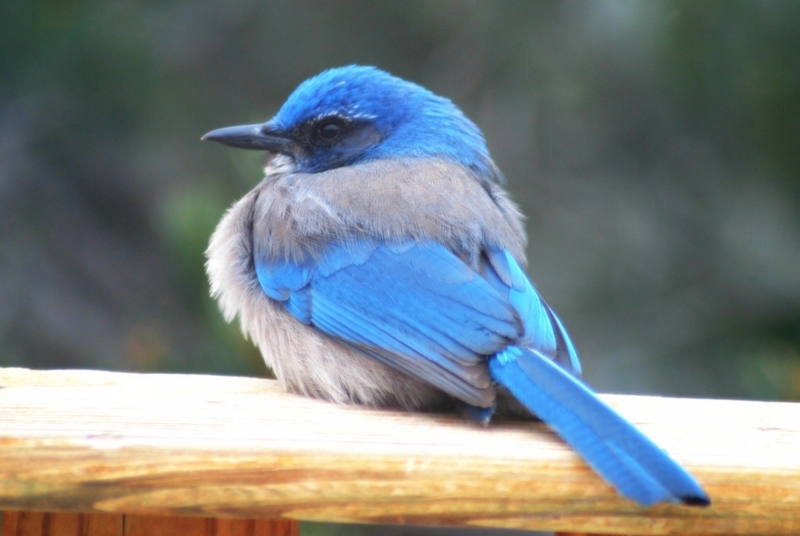 Our backyard birds are just beautiful, and I’ve taken great care to place our feeders close enough to the windows so that if any bird flies into the window it shouldn’t be hard enough to result in their death. But, it does happen on occasion. This was one such occasion and it broke my heart. He gave me that look. The look that indicates he has no response for such an absurd idea. But I’m not so sure it was an absurd idea. 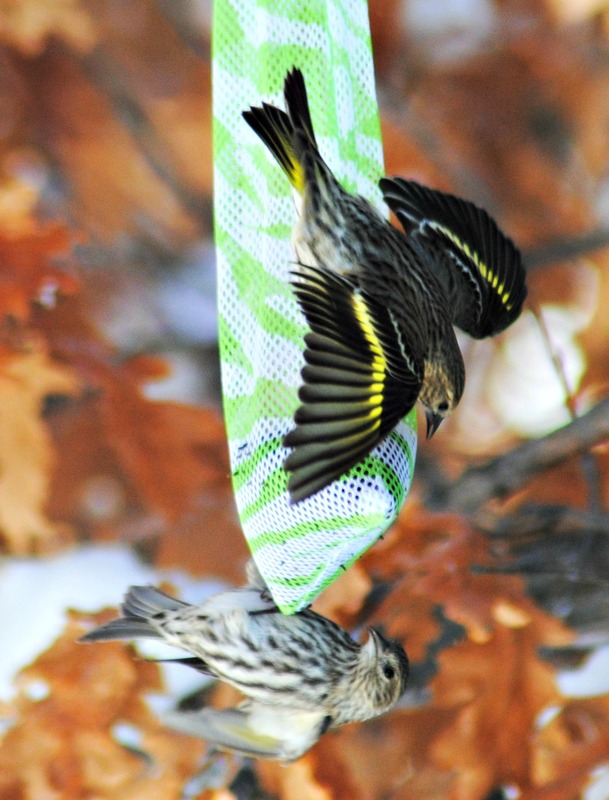 The pine siskin is in fact a beautiful bird. 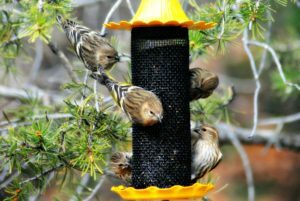 Yes, they monopolize my thistle feeders. Yes, they can eat me out of house and home. 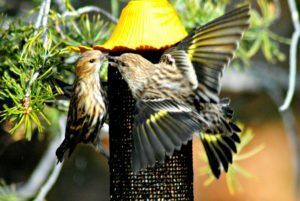 But their brown streaked acrobatic flashes of yellow are fascinating to watch as they flutter in between feeders. 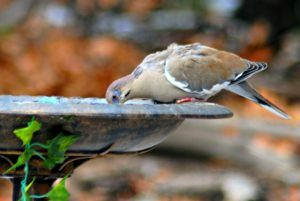 And, I’m grateful to have them visit my backyard as they are known to range widely and erratically across the country each winter in response to seed crops. Only God knows how long they’ll stick around. 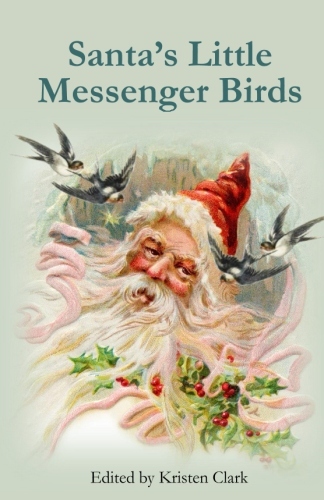 A few hours later I headed out into the flurry – snowflakes and birds fluttered alike – and I refilled the feeders. Another oncoming storm meant more birds would be coming and that picked up my spirits . . . in spite of the day’s loss.